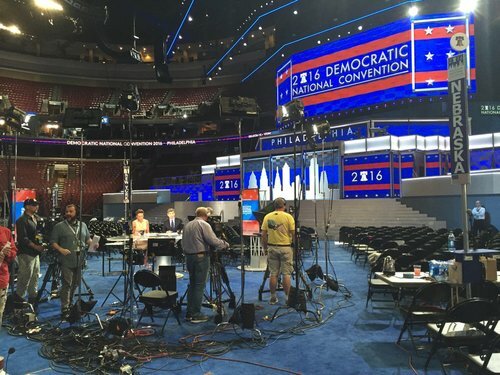 The 2016 Democratic National Convention is from Monday July 25 until Thursday July 28. 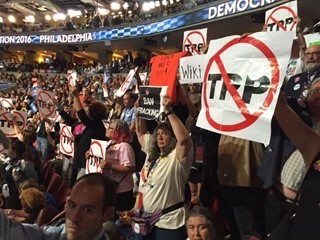 Get live updates and analysis from the ABC News team as the action at the convention in Philadelphia unfolds. Claim: Hillary Clinton launched a State Department program to counter terrorists online. Status: True, but an independent review of the program reportedly found “scant evidence” it had diminished terrorism recruiting, and Hillary Clinton and the Obama Administration have acknowledged the effort’s shortcomings. Background: As Secretary of State, Hillary Clinton created a program to discredit violent jihadist messages online and offer a counter-narrative aimed at dissuading would-be terrorist recruits. But an independent review conducted last year by a panel comprising Google and Twitter veterans, as well as marketing experts and data scientists, reportedly found “scant evidence” the program had succeeded in its mission. Another core finding was that counter-messaging originating from the United States lacked credibility, which Josh Earnest acknowledged in a White House press briefing in December. That recognition has led the Obama Administration to shift the focus away from U.S. government-produced content, toward partnering with allied governments who may be viewed as more credible messengers. Joe Biden on Why Some in Working Class Support Trump: "He Has Been Successful on Playing on Their Fears"
Democratic speakers said Donald Trump's name just 38 times Tuesday, down from 138 times Monday. Bill Clinton did not mention Trump a single time during his speech. After Monday, the Democrats were on pace to say "Donald Trump" more than Republicans said "Hillary Clinton" during the RNC. 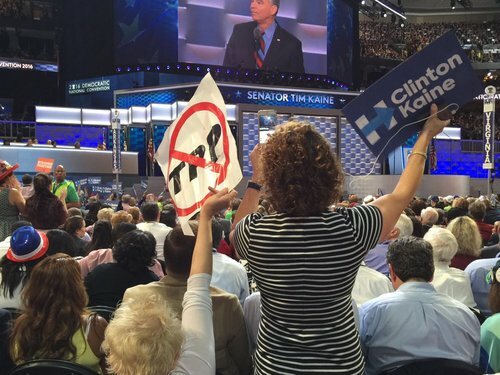 This is evidence that day two of the Democratic National Convention was focused on Hillary. The Secret Service Arrested four people at the 2016 Democratic National Convention last night for jumping a fence into a secure area. As of this morning, the total number of citations and code violations issued by Philadelphia Police stands at 59. Those citations are not arrests. The four arrested for jumping the fence face possible federal charges as well. NEW: Four arrests were made and five citations issued last night around #DemsinPhilly, bringing total citation number to 59. 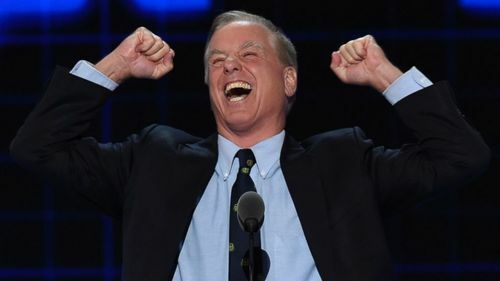 Former Vermont governor and 2004 Democratic presidential candidate Howard Dean reprised his infamous "Dean Scream" Tuesday night at the Democratic National Convention. "This race is going to be won on the ground, and it's going to be won in Colorado and in Iowa and North Carolina and Michigan and Florida and Pennsylvania and then we go to the White House!" Dean screamed in a self-depreciating manner. Dean was widely ridiculed more than a decade ago for his yell in a speech to supporters after a third-place finish in the Iowa caucuses behind then Sens. John Edward of North Carolina and John Kerry of Massachusetts.Watch the video here. #DNCWalkout, the preferred hash tag for those who showed their displeasure with the DNC by walking out after Hillary Clinton won the nomination, accounted for 83,000 tweets last night, with a peak of 14,500 tweets between 10 and 11 p.m. These are decent numbers, but hardly the vitality a movement like that would hope for. Lower-tier hash tags like #demexit, #bernieorbust, and the Jill Stein-inspired #JillnotHill each received a few thousand tweets. By contrast, #DemsinPhilly generated 1.5 million in traffic. Several members of the "Pitch Perfect" cast are "with her." Elizabeth Banks, John Michael Higgins and Hana Mae Lee are just a few of the celebrities singing Rachel Platten's "Fight Song" a cappella in a new video released by Banks on Tuesday night. Platten also appears in the video, as do Jane Fonda, Connie Britton, America Ferrera, Eva Longoria, Kristin Chenoweth, Mandy Moore, Sia, and "Modern Family" stars Julie Bowen and Jesse Tyler Ferguson, among others. Read more by ABC's LESLEY MESSER here. I got together with some friends for the Democratic National Convention. We believe in Hillary Clinton. We love the sound of the first woman president! 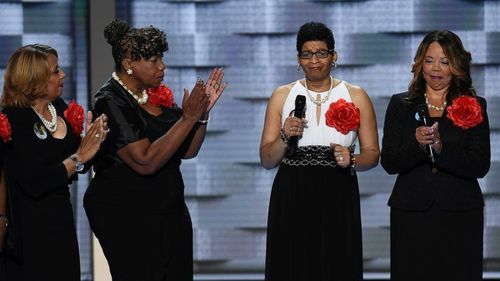 An emotional moment during the Democratic National Conventioncame when the mothers of African-Americans who were the victims ofgun violence or police-involved deaths made a plea to voters to chooseHillary Clinton in November because she "isn't afraid to say black lives matter." The women, called “The Mothers of the Movement,” took turns speaking of their anguish of losing their children. 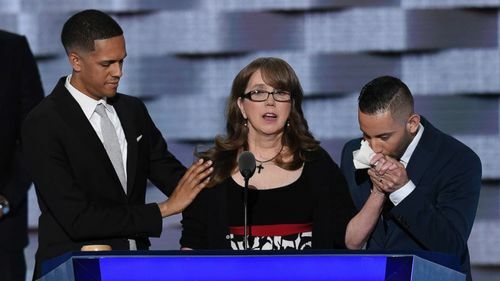 “I lived in fear my son would die like this,” said Lucia McBath, the mother of 17-year-old Jordan Davis, who was fatally shot by man who was upset about the volume of the music in the car her son was in. The man who shot Davis, Michael Dunn, was sentenced to life in prison in 2014. Read more from ABC's MEGHAN KENEALLY here. ABC's ALI ROGIN: President Obama isn’t the only elected official giving his last major address tonight. Senate Democratic Leader Harry Reid, who is ending his five-term Senate career at the end of the year, shares that distinction – and his fellow Democratic colleagues taped a three-minute video tribute to honor him that will be played later tonight at the DNC. Sen. Elizabeth Warren reveals in the video that Reid tried to recruit her to come to Washington – presumably the Senate – well before she took the job as the head of the Consumer Financial Protection Bureau. Others, like Sen. Chuck Schumer, who is likely to take over Reid’s position as Democratic Leader, gave more humorous tributes. “He didn’t like it that I never shined my shoes. He’d slip me 20 dollars and said ‘here. Here’s 20 dollars. Go shine your shoes,’” Schumer says. “Anybody who’s ever had a phone call with Harry Reid knows at some point you’re going to be talking to yourself. Because he’s long gone,” House Democratic Leader Nancy Pelosi said, noting his propensity towards short phone calls. Reid himself nods to his youthful career as an amateur boxer – a point that reporters are basically contractually obligated to include in any story about the man from Searchlight, Nevada. “I’ve had some proud fights. Real fights, some of those I’m proud of. I remember the first person I knocked out. And then the other fights I’ve had, not dealing with my fists,” Reid said. Sen. Bernie Sanders and President Obama also chime in. “Harry, we’ve had a good run. You and I, we’ve fought the good fight and we did it together,” the president says. ABC's VERONICA STRACQUALURSI: The mother of one of the 49 victims killed in the shooting at an Orlando nightclub last month gave an emotional speech tonight. Leinonen also said her son was a big Hillary supporter and that she supports Clinton. ABC's ADAM KELSEY: "I am furious," said Sen. Chris Murphy. "I am furious that in three years since Sandy Hook, three years of almost daily bloodshed in our cities, the Republican Congress has done absolutely nothing to prevent the next massacre." Murphy, the junior senator from Connecticut, described what it was like to sit with those grieving in Newtown, Connecticut almost four years ago in the hours after the shooting at Sandy Hook Elementary School. In early June, Murphy stood on the floor of the senate for 15 hours to argue for stricter gun control measures to combat what happened in his state in 2012. Tonight, he expressed concerns that a Trump administration would move in the opposite direction. "Trump said that by the end of his first day in office, he’ll mandate that every school in America allow guns in their classrooms," said Murphy. He ended with a passionate plea to the public to learn about gun law loopholes, become an activist and to elect Hillary Clinton. Sandy Hook principal Dawn Hochsprung's daughter: "I would give every other day I have left to have just one more day with my mom." Former Philadelphia Police Commissioner Charles Ramsey speaking now at the convention: "To protect our law enforcement officers and to serve the memory of those heroes who have fallen, we need commonsense measures to reduce gun violence." Kaine gets in a reference about Trump's hands, possibly a call back to Rubio's quips from the primary. Kaine: "Hillary Clinton is lista"
. @timkaine: "Our nation is too great to put it in the hands of a slick-talking, empty-promising, self-promoting, one man wrecking crew." 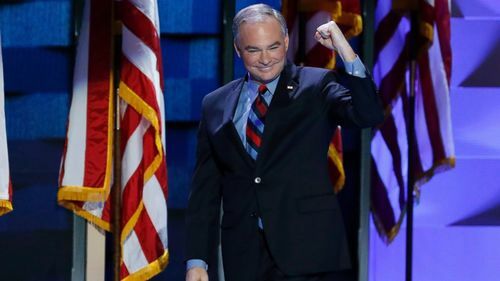 ABC's MEGHAN KENEALLY: Sen. Tim Kaine formally accepted the Democratic nomination as vice president Wednesday, saying that he trusts Hillary Clinton with the life of his son, who is in the military, lacing into Donald Trump. "I never expected to be here," he said. He was officially nominated as the party's nominee after a voice vote on the floor of the convention this afternoon. Clinton announced last Friday that Kaine, a sitting Senator for Virginia, would be her running-mate. Kaine addressed the audience in Spanish briefly when he brought up the year he spent as a volunteer with Jesuits in Honduras, saying that there was an emphasis on “faith, family and work." Right as @timkaine's speech concludes, Clinton camp announces Richmond, VA homecoming rally set for Monday. "Obama" signs being brought out to crowd now. A video tracing Barrack Obama's presidency and the government's response to the "Great Recession," the fight for health care reform and the mission to kill Osama bin Laden is currently playing in Philadelphia. Narrating part of the introduction video for President Obama is actor Bryan Cranston. Tim Kaine is just your average dad. 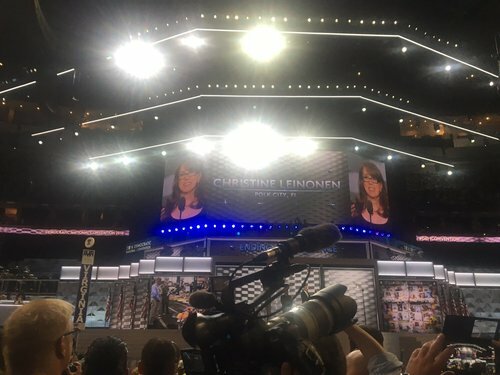 Hillary Clinton's running mate exuded a paternal demeanor during his prime time speech at the Democratic National Convention on Wednesday night, and Twitter took notice. The Democratic vice presidential nominee, who was previously unknown to many Americans, introduced himself on stage as the 58-year-old Virginia senator with humble beginnings in Minnesota. Kaine cited faith, family and work as core values and he admitted that he "never expected to be here." But to Twitter users, Kaine was your friend's overly nice dad who everyone likes but is slightly awkward. So they crafted their finest dad jokes and posted them on Twitter. For the final DNC Daily Briefing, Campaign Manager Robby Mook talked about the successes of the last few nights and how Clinton will "weave" the themes of the week together in her nomination acceptance speech this evening. 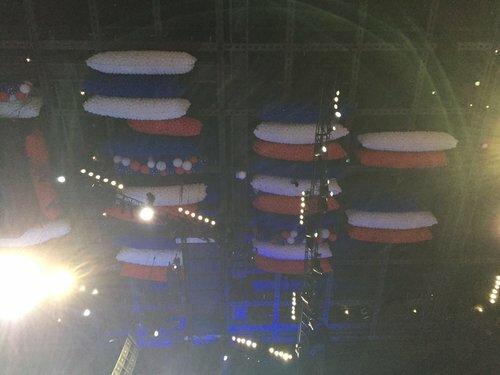 “Tonight in her speech Hillary is going to stitch together each of these themes and talk about how this election is really a moment of reckoning for the voters,” Mook said. would flesh out the idea, "it takes a village" with the type of policies she will implement. ("It Takes a Village" was the title of a book Clinton published in 1996 when she was First Lady). Palmieri said the Secretary will not have a walk through tonight ("I don't believe so....she had her walk through last night," she said with a smile). Palmieri confirmed Trump will be a topic of discussion. “He is our opponent and part of what she will discuss is the choice in the election,” she said.